Atmospheric elements like the sun and the wind deprive your skin of moisture. The protective oils present in the outermost layer of the skin act to reverse this damaging effect. As these oils get stripped easily, you must intervene to choose the appropriate dry skin care products that will help retain the moisture content of your skin. Of course, there is no dearth of such products in the thriving global cosmetic industry, but you must exercise caution in picking up products for your dry skin care routine and ensure that you choose only those products that are right for your skin type. 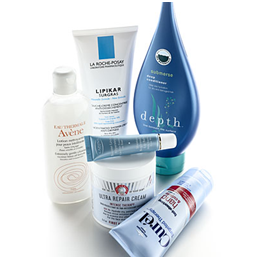 Pick the best dry skin care products among the many available in the market. Taking a few measures on an everyday basis can alleviate the symptoms of dry skin and leave your skin feeling smoother and well groomed. Here are some tips to help you care for your dry skin. Do not shower for long in hot water, as it strips your skin of oils. As for soap for your body, go in for mild and unscented cleansers. These are substances that hold the moisture in the skin and make it supple. There are synthetic ceramides available in the market that retain the skin’s moisture, functioning like the natural oils present in the outermost layer of the skin. Some other ingredients you should look out for in skin care products are hyaluronic acid, lanolin, mineral oil, petroleum jelly, dimethicone, and glycerin. These substances also help retain skin moisture and prevent dryness. Always wear a sunscreen before you step out of your house. Pick a sunscreen labeled “broad spectrum” and having an SPF of 15 or higher. Begin skin care for dry skin by applying a liberal amount of sunscreen when you venture outdoors. Plug in a humidifier while you’re at home during the winter months, as it helps keep your skin hydrated. Consume foods that contain omega-3 fatty acids, such as salmon, flax seeds, walnuts, and safflower oil. This helps strengthen your skin’s natural oil-withholding barriers. Try applying Hydrocortisone cream on the itchy areas of your skin, for a week. If the dryness persists, consult a doctor. Wear clothing made of cotton and natural fibers. Avoid wool and other synthetic materials as they often lead to the itching of the skin. Say goodbye to dry skin by taking appropriate care of it and making well-informed decisions while purchasing dry skin care products. These simple measures are surely going to leave your skin looking gorgeous! This entry was posted in Wellness and tagged how to take care of dry skin, skin care for dry skin by Zipheal Editorial Staff. Bookmark the permalink.